In the bowl of a stand mixer, combine the butter, brown sugar and granulated sugar. Using the beater attachment, beat the mixture on low for 30 seconds and then on high for 2 minutes, scraping down the bowl as necessary. Add the eggs and vanilla extract and beat for 1 minute. Meanwhile, in a small bowl, whisk together the flour, baking soda, cinnamon and salt. With the stand mixer running on low, add the flour mixture to the wet ingredients little by little, until combined. Add the oats and cranberries and beat to combine. Stir the chocolate chunks until dispersed throughout. The dough will be pretty stiff. Using a cookie scoop, scoop the cookies onto the prepared baking sheet, placing them about 1 1/2 inches apart. Bake the cookies for 11-13 minutes, until golden at the edges. Let cool 5 minutes before transferring to a wire cooling rack. Repeat steps 5-7 until all of the dough has been used. 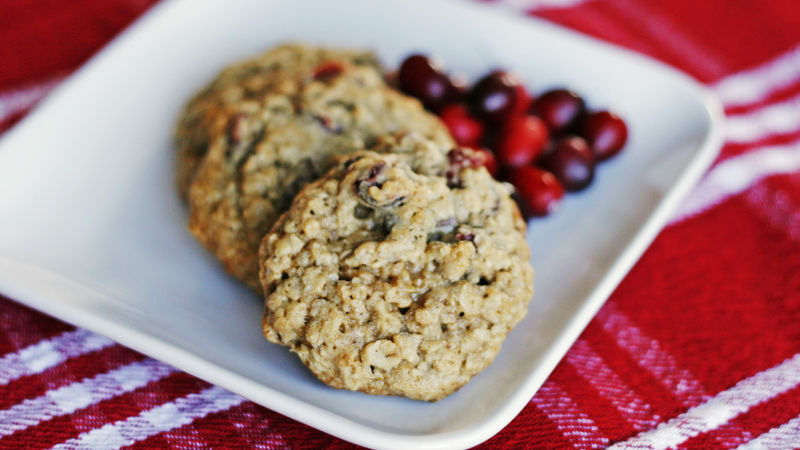 There have been so many amazing cookies here on Tablespoon lately, and I wanted to share one of my favorites: Cranberry Chocolate Chunk Oatmeal Cookies. These are a riff on the classic oatmeal raisin cookies. The raisins are swapped out for dried cranberries (which I love, love, love) and they are filled up with chunks of semi-sweet chocolate (which you can buy precut in the grocery store baking aisle!). The result is a sweet, chocolaty, slightly tart (thanks to those dried cranberries) cookie with a lot of substance to it. My daughter, who isn’t a huge sweets fan, couldn’t get enough of these babies. And my son (who is a sweet-a-holic) loved them too. And I want to share a little trick with you too. My cousin is an avid baker, and clued me into this. When you make cookie dough and don’t want to make all the cookies, you can freeze the dough for later use. The trick to make it super easy is to portion the dough out into cookie-sized bits. I always use a cookie scoop for drop cookies, so I use that to produce even-sized little balls of dough. Then I place them close together (but not touching) on a waxed paper–lined baking sheet. Freeze them until they are hard and then transfer to a freezer bag. You’ll want to write the variety and baking instructions on the bag as well. Stick them back in the freezer and you are good to go. Then you can just grab cookies and defrost on a cookie sheet as needed. So, with holiday cookies, this means that I can make one batch of this dough and cook them a dozen at a time…Fresh cookies for all of our holiday events!